Creighton University welcomes a new professional student organization sponsored by the Health Sciences Multicultural and Community Affairs (HS-MACA) to its campus. 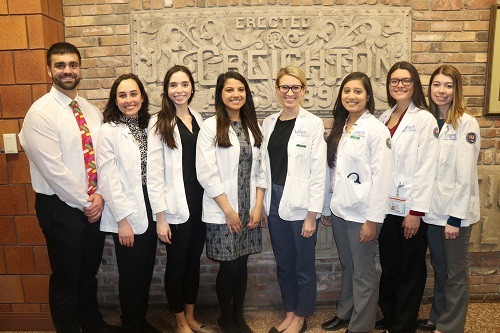 The Latino Multicultural Student Association, LMSA was launched in 2019 as a subsidiary to the nationally recognized Latino Medical Student Association. The mission of the Latino Multicultural Student Association (LMSA) is to promote and advance the presence of Latino professionals in the healthcare field in order to better serve underserved patient populations. LMSA will also focus on improving Latino cultural knowledge to allow for Creighton students to become more culturally competent healthcare professionals. Furthermore, the LMSA will focus on mentorship to cultivate the professional growth of individuals who will work towards better healthcare outcomes for these underserved patient populations. This is an inclusive group! All are welcome to join. To learn more about LMSA visit https://cuinvolved.creighton.edu/organization/lmsa or email lmsa@lists.creighton.edu.